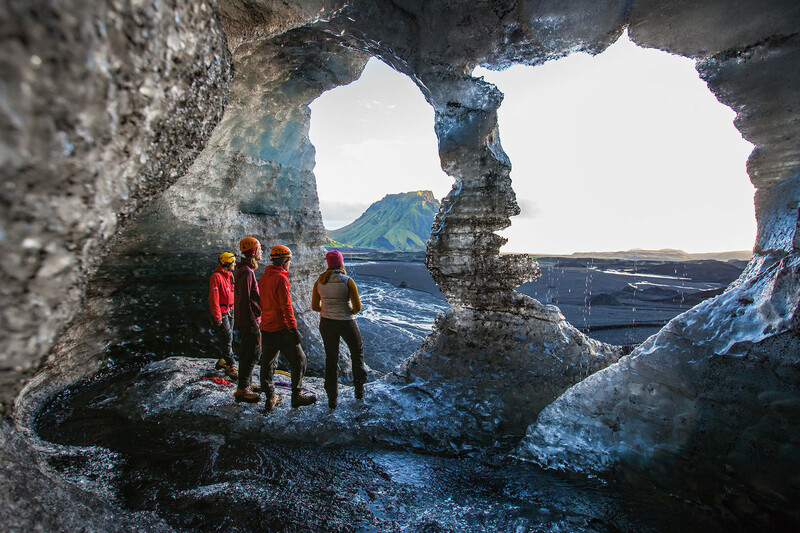 An exploration of the Secret Ice Cave on this small-group day-tour from Reykjavík. Located directly underneath the dormant volcano Katla, the ice caves of Kötlujökull (or Katla’s glacier) are a testament to the natural forces that have shaped this country. On the way up to the cave you you can enjoy the unique surroundings of vast black sands mixed with mossy green mountains. Once there, you are greeted with an ash covered wall of ice, marked by the volcanic eruptions of the past. As you walk closer to the glacier, an enchanting opening will appear that will allow you to explore the insides of the glacier. The cave’s illuminating blue ice walls form a high contrast with the surrounding black ash and are a marvelous sight. On the way back to Reykjavík, you will have time to explore the classic sights of the South Coast with a stop at the waterfalls Seljalandsfoss and Skógafoss. This is the only tour available that allows you to travel from Reykjavík to explore a natural ice cave and get back to the city in time for dinner. Please note: This tour is run by our selected partners Katlatrack. If you have your own transport, please take a look at the Secret Ice Cave, with departure form Vík. Disclaimer: Please note that ice caves are a natural phenomena and the conditions can change depending on weather. Your safety is our first priority. It is possible that our tours may be canceled with short notice due to weather conditions or safety concerns. If this happens, we will always do our best to offer you an alternative tour, if weather permits. Minimum 2 persons is needed to run this tour. Pick starts at 7:45 - 8:00 Reykjavík City Hall and from Hlemmur square 8:00-8:15. Please be ready 10 min before departure.